When I encountered this massive bull it was with my camera in hand, not a remote control unit. I was very conscious of the distance between us – it would have been both illegal and foolish for me to move any closer, but there was always the chance that the bison would take this issue out of my hands. I was knee deep in snow and I would not have fancied my chances of scrambling backwards. 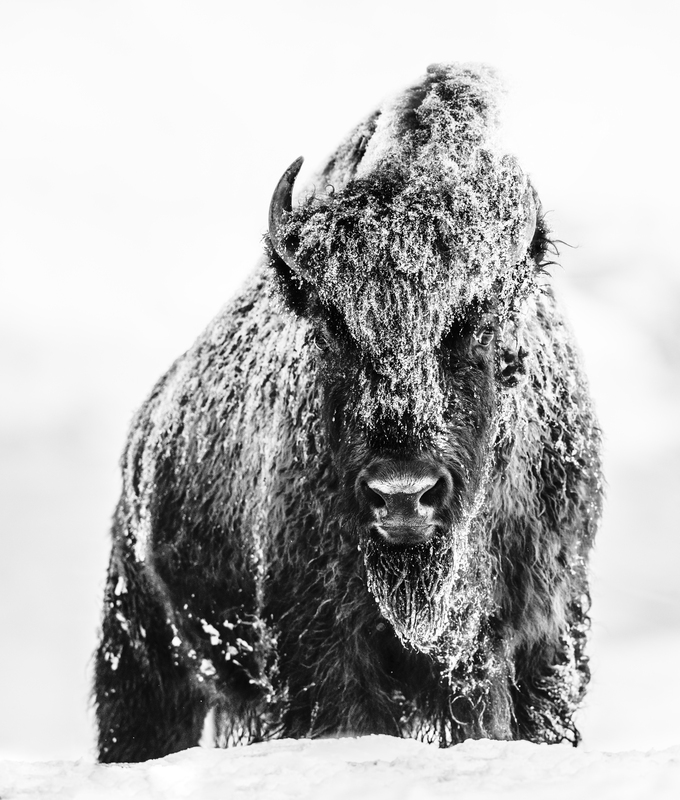 The temperature that early morning was just under -15 degrees Celsius – not super cold, but cold enough for snow to have settled on the bison’s primal face. This was very much my preconceived goal when I was researching Yellowstone. He looks like a mythological creature from a primal age, not a bison in 2017. I prefer not to use the magnification and distance compression of telephoto lenses, but sometimes – like in this “head on” situation – they serve a purpose as there is simply no safe or practical alternative. The key issue for me is the validity of the chosen focal point – as much of what is behind and much of what is in front of that point will quickly lose detail – no matter the lens apeture. To lose it behind is okay , but in front can create too big a tension point for the image to work. I remember worrying about my focus at the time and straight after – as these encounters happen all too quickly. But many hours later, back in the warmth of my modest motel room, I looked at the detail in the nose and around the eyes and I knew that I had a shot. What a total beast of an animal. Focus is everything in photography – no more so than at 10,000 feet up, deep in snow, with a bison in your face at -15 degrees celsius. This was not a normal morning.